Today's Las Vegas is a hub of incredible places to eat. But those who are really in the know will skip the Strip in favor of a humble strip mall where Lotus of Siam has been serving some of the best Thai food in the country for the past 15 years. Thanks to restaurateurs such as Charlie Palmer, Wolfgang Puck, Joël Robuchon and Laurent Tourondel, today’s Las Vegas is a hub of incredible places to eat. But those who are really in the know will skip the Strip in favor of a humble strip mall where Lotus of Siam has been serving some of the best Thai food in the country for the past 15 years. There, chef Saipin Chutima prepares more than 150 dishes, which means you’ll have to make a few trips to try everything. But the Khao Soi is essential. “It’s almost like a curry, but not really,” says says Chutima, who was living near the border between Burma and Yunnan province when she learned to make the dish of egg noodles in a spicy, aromatic coconut broth. 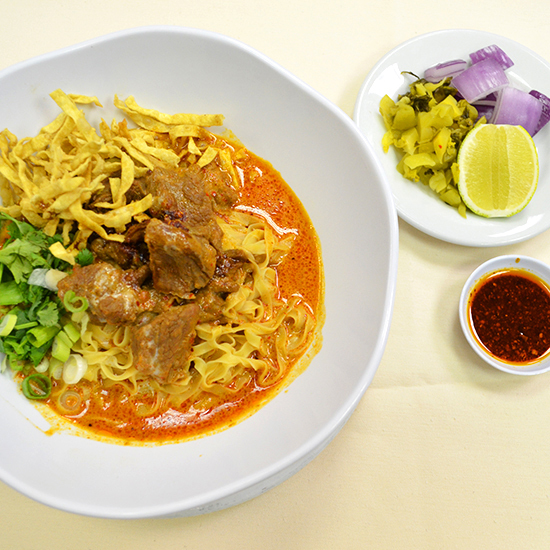 The most popular version of Khao Soi at Lotus of Siam is made with beef and served with a lime, onion and pickled vegetables on the side. It’s the perfect way to celebrate a big win—or console yourself after losing your shirt.